Happy December 1st! Because I was very kindly given the Liberty Beauty Advent Calendar this year, I thought I'd try to post a reveal every day leading up to Christmas, to show which goodies are hiding in the lovely Liberty print drawers. I'm doing this as if you hadn't googled the contents in a frenzy when it was first released. This is, without a doubt, the most impressive (and largest) advent calendar I've ever owned and it's brimming with all kinds of miniature and full sized beauty bits. I'm not going to pretend I haven't had a sneaky look inside (all of) the drawers but now that it's December, I can open a drawer a day and actually use the products completely guilt free and without the fear of being caught by my boyfriend. Today's Liberty gift is a 30ml tube of Byredo Parfums hand cream. Worth an impressive £23, the shea butter based hand cream is thick, luxurious and very heavily scented. I received the 'Blanche' fragrance, but I have seen that people had all kinds of different fragrances in their calendars. Blanche is a pretty gorgeous scent so I'm very happy it was hiding in my advent calendar. Blanch has top notes of White Rose, Pink Pepper and Aldehyde, Violet, Neroli and Peony at the heart and base notes of Sandalwood, Blonde Woods and Musk. It's a clean, pretty scent and the hand cream's formula is thick yet non greasy. 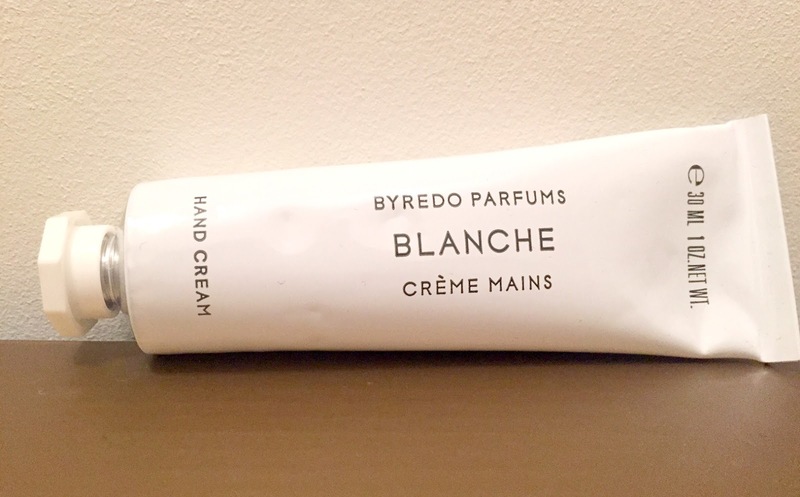 You can find Byredo Parfums hand creams at Liberty here. This is for sure a top pick! Next year I want Jo Malone or Liberty. I picked up YOU Beauty, hubby got me M&S (on the 20% off day) and I had a last minute buy of 4160Tuesdays very limited edition one which I am loving!